1. Lay out what you have! Choose which pearls you would like on your ring. 2. Try different combinations with different sized pearls. 3. Once you are sure of which combination to use, try the wire ring on for size. If it is too big for your finger, you can cut for size using wire-cutter pliers or even a scissors. 4. Before working with superglue, always have old newspapers on your table. Have the ends of the wires be parallel with your table or tilted downwards. By the laws of gravity, the superglue will fall/drip onto the table instead of your fingers. The old newspapers are there to catch any drips and spills. You may also dab off excess, drippy superglue onto the old newspapers before proceeding with the next step. Accidentally got superglue on your fingers? Dab them away with cotton soaked in oil or nailpolish remover until the superglue is fully dissolved! Wash your hands with soap and water immediately after. 5. Dab the superglue onto one end of the wire, and insert the pearl. Repeat for the other end of the wire. 6. 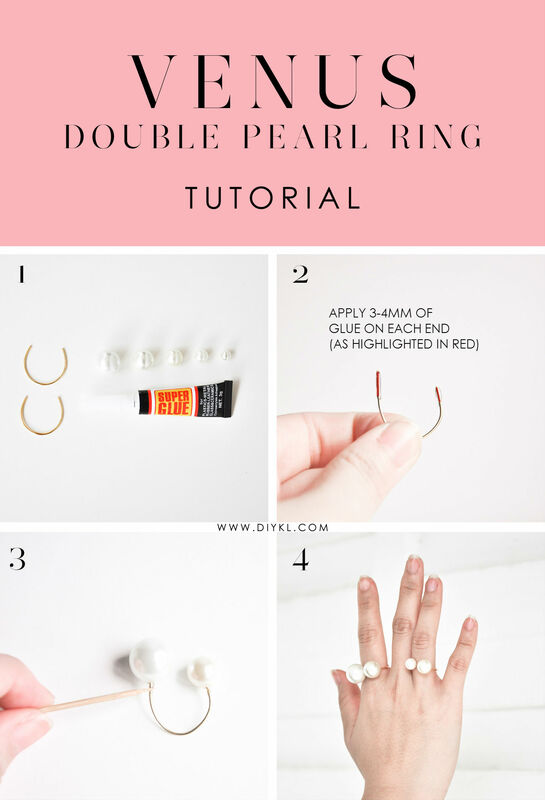 Allow your newly-made VENUS Double Pearl Ring to dry for at least 10 minutes. 7. While you wait for your first ring to dry, why not make another one? Follow the same steps above and enjoy! Have a fabulous ring party!